At Watches&Wonders 2014, Jaeger-LeCoultre will add yet another multi-complication to its high jewellery range with the new Grande Tradition Grande Complication Haute Joaillerie. 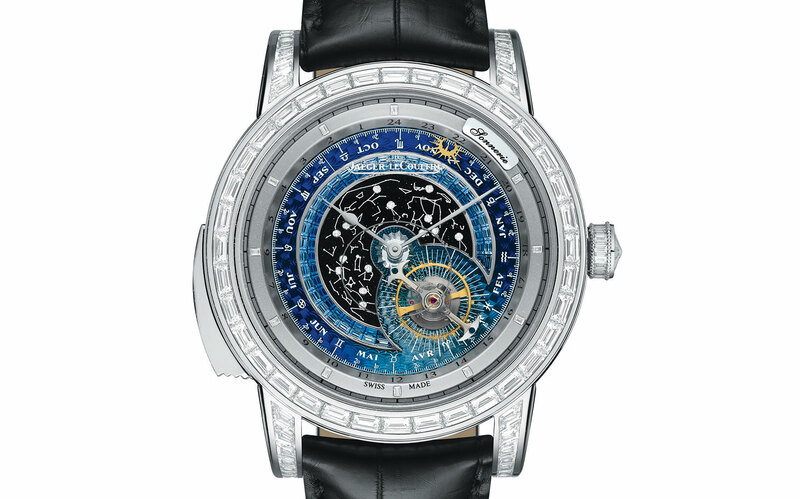 It features a tourbillon, minute repeater, zodiacal calendar, along with nearly 300 baguette-cut diamonds. Adding a large dose of baguette-cut diamonds – which tend to be more masculine than brilliant-cut stones – to existing grand complications is something that Jaeger-LeCoultre has done frequently and well, with the Spherotourbillon being a sparkling example. Joining that parade of gemstones is the Master Grande Tradition Grande Complication. The Master Grande Tradition Grande Complication is a triple complication. 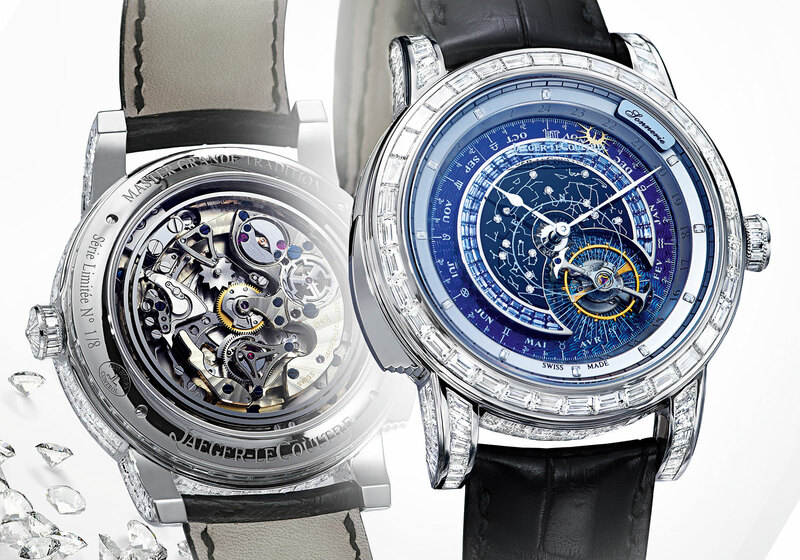 First, it features Jaeger-LeCoultre’s minute repeater with crystal gongs and trebuchet hammers. Here the gongs are soldered to the sapphire crystal for extra resonance, while the repeater hammers have two pivots, like a trebuchet, for added striking power. Made of sparkling aventurine to simulate the night sky, the dial is actually a star chart showing the sky of the Northern Hemisphere. This also indicates the zodiac sign, and annual calendar with the date and month display. And the last complication is the orbital flying tourbillon, making one revolution a minute. But it is also mounted on the sky chart disc, meaning the tourbillon makes one revolution around the dial every 23 hours and 56 minutes, hence the moniker “orbital”. Unusually the escapement, meaning the escape wheel and pallet fork, is made of silicon, a rare feature in watches from Richemont-owned brands. The reason being the three watch brands that are shareholders in CSEM, the Swiss lab that pioneered and developed silicon for use in watchmaking, are Rolex, the Swatch Group and Patek Philippe. 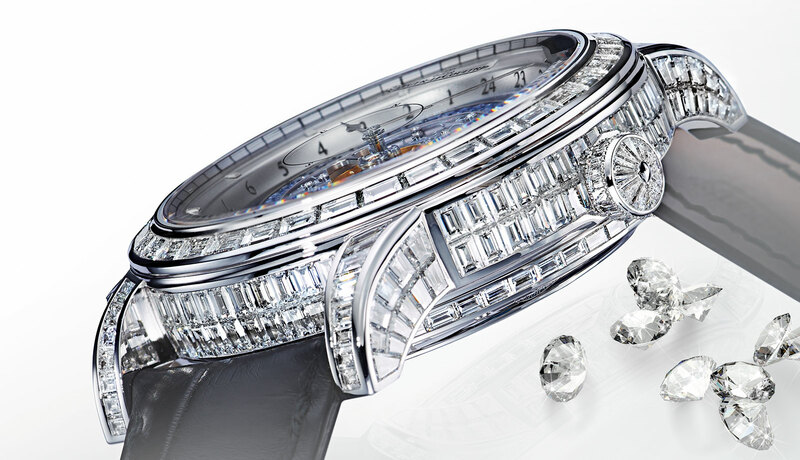 The white gold case is 46.7 mm in diameter, with 294 baguette-cut diamonds totalling 19.8 carats. Made in a limited edition of eight piece, this retails for €285,000 before taxes, equivalent to about US$386,000.